One of my good friends is moving to the country too, about 10 minutes from where our new house will be. A few weeks ago we were texting back and forth about the build process and living in the country; we both want to have chickens living in a cute coup providing fresh eggs for us! The funny part? Who would have thought back in the day by the time we had cell phones and technology solutions for everything that we’d be discussing raising chickens via text! Our home will certainly be a healthy combination of simple country life and modern day technology. Allen is an IT guy so he’s already talking about the walk-through with the electrician and the smart house type wiring he wants to do. I’m focused on our garden and ‘pets’. Speaking of the chickens…Joanna Gaines set the bar high with chicken coup design. If you love gardening, check out the Fixer Upper episode featuring their personal garden on their farmland. You will fall in love. I can’t wait to make recipes like this with fresh eggs and herbs from our backyard. Egg salad is one of those staple spring recipes and I think it’s even a law that you serve it at bridal showers, baby showers, graduations parties and brunches. That along with chicken salad and pasta salad of course. Basically, spring = salad! And then avocados became popular and changed up the game. Now every salad has an avocado version! I’m not mad about it either; I’m totally riding the avocado bandwagon! It’s a big bonus in these recipes when it comes to the healthy factor, because adding avocado means you can remove the mayo! This egg salad is easy peasy, lemon squeezy. You’ll need hard boiled eggs, avocado, lemon, fresh dill and parsley and a pinch of salt. I served ours on everything bagels, but that’s really just because I’m a great wifey. My husband loves everything bagels! For some reason I don’t have much of a taste for them and would choose a croissant or wheat berry bread for my egg salad! If you want to take the presentation to the next level feel free to add some micro sprouts and thin radishes as garnish! Now, if I publish this post will it bring on true spring weather? Winter has lasted for what seems like forever in Ohio this year! We had snow just yesterday and I’m completely over it. I want to put my winter coat away and bring out the flip flops! Here’s to hoping! Enjoy!! 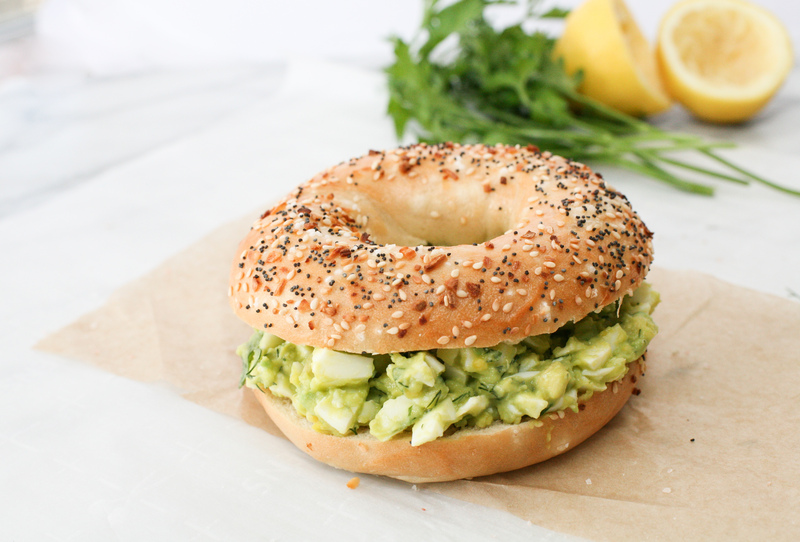 Healthy Egg Salad thanks to avocado taking Mayo's place in this recipe! Boil fresh eggs using your tried and true method. Once cooked, add eggs to a bowl of ice water to cool and once they've cooled off enough run under cold water, peel and cut into small pieces. Add those small pieces to a large mixing bowl. Mash the avocados until mostly smooth. Add to the bowl of eggs. Add herbs, lemon juice and salt and mix all ingredients together. You can serve immediately or chill in the fridge for 30 minutes first (my preference)! I didn't measure the herbs, but I used around 1/4 cup total (parsley and dill mixed together in the same measuring cup. You can always add if needed! This entry was posted in Lunch, Recipe Book and tagged avocado, avocado egg salad, baby shower menu, bridal shower menu, brunch recipes, egg salad, egg salad recipes, eggs, salad, spring recipes. Bookmark the permalink. oh yum pinning this so i can try it when my avocados come in. Thanks, Jiselle! Do you grow your own avocados? Being able to pick them right off the tree would be amazing!